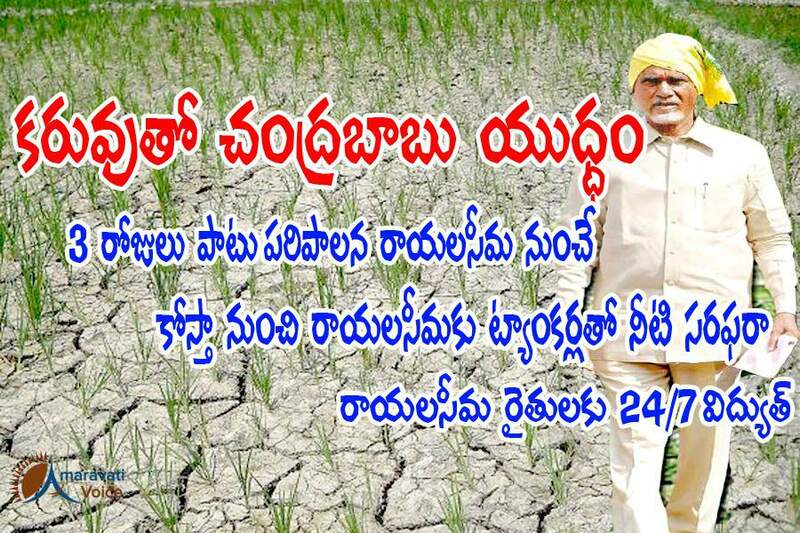 To overcome the drought situation in the 4 districts of Rayalaseema, Chief Minister Chandrababu Naidu, is going to monitor the situation from the ground level. For the next three days, Andhra Pradesh Administration would be functioning from Rayalaseema. As many as 21 IAS officers are deployed in Anantapur and Chittor Districts to monitor the drought situation. For every two constituency one minister is given the duty. Chief Minister has instructed to bring water from coastal districts, through water tankers and use the water to sprinkle the dry fields with rain guns, to save the crops in the four districts of Rayalaseema. Already Guntur District administration has sent around 100 water tankers. As per the instructions of Chief Minister Chandrababu Naidu, AP Transco and AP Genco are gearing up to supply 600 additional MW power to four Rayalaseema districts of Andhra Pradesh to protect the crops which are withering due to dry spell conditions. The government is trying to get power from all its own resources and purchase power from other States, if necessary to supply 24 hours uninterrupted power to above-mentioned districts. Energy department estimated that 500 to 600 MW additional power is required to meet the demand in Rayalaseema region this season to save the crops. The supply of additional power started on Sunday to Rayalaseema districts. Also Government is trying to give daytime power supply to the farmers in the State so that they can use rain guns for Wetting of crops.